As I have stated several times in previous posts of this blog, I back up my photo and video collection using the embedded Backup command that is available in all versions of Photoshop Elements, including PSE 11. This command and its counterpart, the Restore command, have worked well for me over the last ten-plus years or so. My Catalog currently has over 36,000 items and takes hours to back up to a USB 3.0 external drive. It is my key protection in case disaster strikes. Recently, as is my normal practice I took a quick look at my most recent back-up folder as I was preparing to do a full back-up. A back-up folder generally consists of a series of JPEG images (your photos) that have each been renamed in sequential fashion, beginning with the letter “B”. These files are your full resolution images, which can be opened by double clicking on them. If your Catalog also includes videos and audio files they will be included in this series of renamed files. There will be most likely a series of .XMP files that contain information about the media files. At the bottom of this list, there will be two additional files, the catalog.buc and the backup.tly file. These are extremely important. These two files are used to reconstruct your Catalog during the Restore process. Without these two files, all you have is a bunch of photo images that contain little or no information to help you identify them, other than your memory. The figure below shows a small part of one of my back-ups. When I looked at my last back-up folder, the backup.tly and the catalog.buc folder were not there! That full back-up would have been of little use in restoring my catalog if I had needed to do that. I have no idea why these two files were missing. Perhaps I shut down my computer while the back-up command was being completed in the background. I had received the PSE 11 message saying my back-up had been completed successfully. 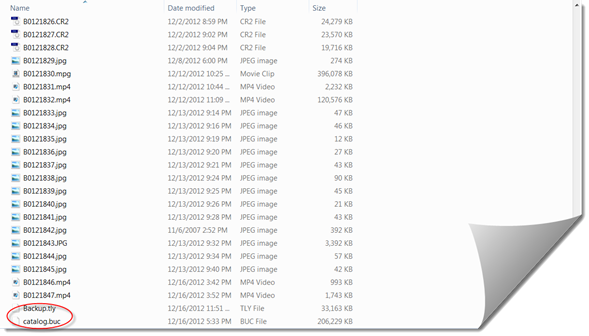 I also looked at other full back-ups I had done with PSE 11, and they all contained these two critical files. I am confident that the program worked properly. But I have now added a new step in my back-up/restore workflow. Once I back up a Catalog, I check to see that there is indeed a .buc and a .tly file listed. 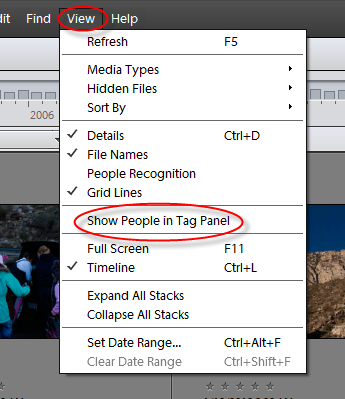 What Happened to My People Category in Photoshop Elements 11? When you first install Photoshop Elements 11 and open the Organizer for the first time the, you will probably want to verify that all of your Categories, Sub-Categories, and Tags from your early version’s Catalog survived. Chances are, after a bit of looking, you will find that your Events Category is now listed as Events (Tags) in the Tags Panel, and your Places Category is shown as Places (Tags), but your People Category is missing entirely. Well it’s there. You just have to make it visible. On the Menu bar click on View > Show People Tags Panel, as shown in the Figure below. Now you will see your People Category from your converted Catalog, but it will be permanently placed at the bottom of the Tags Panel. It cannot be repositioned as is the case for other Categories. Adobe really wants you to start using the People environment or workspace at the top of the Organizer screen.